Academics, lawyers, media organizations, internet platforms and policymakers around the world are watching closely as the LCO prepares to deliver its initial recommendations for reforms to Ontario’s defamation laws. 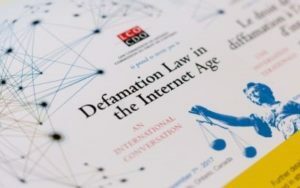 “This is an incredibly important study that speaks to the quality of the work of the Commission, the importance of the subject matter and the broad need to look for an approach that makes sense globally,” explains lawyer Brian Rogers, a specialist in Canadian free expression law, who is one of 17 experts advising the LCO on its defamation law in the internet age project. He points to the study’s rigorous consultations involving interviews and focus groups with hundreds of individual and organizational stakeholders across Ontario and beyond, including lawyers, journalists, media organizations and individual plaintiffs of defamation actions. The LCO also led one study and commissioned another addressing teens and their online reputation. The six-month consultation phase culminated in May 2018 with an international conference involving 150 participants and featuring 21 multidisciplinary and multijurisdictional moderators and speakers from across Canada, the United States, England, Ireland and Australia. Live event updates were provided via Twitter and post-event blogs written by law students, and the event was broadcast live via webcast ). Fourteen students — two students from each of Ontario’s seven law schools — attended the conference with travel expenses paid, thanks to support from a $25,000 Social Sciences and Humanities Research Council of Canada Connections grant. “Our project has attracted the attention of the Supreme Court of Canada and has been referenced in media reports as far away as Australia. Several people have referred to the project as the leading defamation law reform project in the world,” says Sue Gratton, LCO’s counsel assigned to the project. Gratton is now working closely with the advisory group to sift through the volumes of input and formulate draft recommendations to include in an interim report. Early themes include the need to ensure a coherent set of legal principles that apply to both print and online publications and potential recommendations regarding the role of Internet platforms. The research team also recognizes the need for recommendations addressing barriers to access to justice and the possibility of online dispute resolution. “This is our chance to level the playing field,” says Rogers of the LCO’s potential recommendations. The defamation project interim report is planned for release in early 2019, followed by an opportunity for public feedback and a final report in the spring.